Chakra in Sanskrit means wheal, chakras are the energy centres in the human's body which show how healthy we are from a spiritual point of view. Each chakra has a specific place in the body, a colour, a vibration and a different function, when are chakras are functioning properly we radiate perfect health, but when they are out of balance, we too feel sick and unable to perform are best. There are many Chakras but I will focus on the main 7. It connects you to everyone, on a spiritual level, chakra for enlightenment and spiritual understanding. Eat foods that are purple or White to balance this chakra. Connect and send distant reiki to people to increase the effectiveness of this chakra. Positive aspects of this chakra are: self-sacrificing for others, a love for all life, feeling in tune and connected to all things. This chakra is indigo, this chakra when open, gives you clear spiritual sight, it is the place to develope your psychic abilities, strengthen intuition, and an orderly mind. When out of balance you will have inability to trust intuition, lack of concentration and inconsiderate to others. Eat foods that are the colour indigo to balance such as blueberries. This is the communication chakra. It is light blue and helps you to communicate with spirit as well as people, eat foods that are blue to help balance this chakra, or balance this chakra with a blue lace agate crystal. When balanced you are: loyal, trustworthy and when out of balance can be cold, closed off and isolated from others. The Heart Chakra, this chakra is grean. 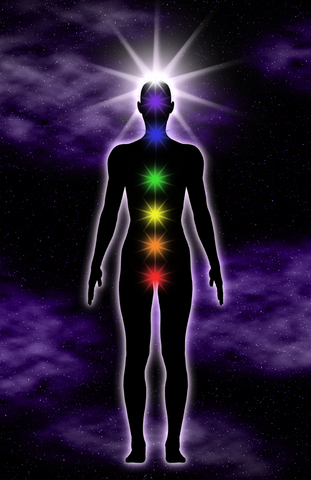 This chakra is the chakra of love and spitiual truth, to balance this chakra eat foods that our grean. In balance, you are compassionate and loving, and caring to all those who cross your path. Out of balance, you can feel jealous, sad, and cut off from others. The solar Plexus is where you get your feelings about life, where you assimilate ideas and thoughts, the worry centre. Here thoughts are digested. Yellow foods will balance this chakra, in balance you may feel confident and able to take on the world, if this chakra is out of balance, may feel sarcastic and over analytical. This Chakra is orange and is where our creative and sexual emotions come from. Orange foods and colours will balance this chakra, when the sacral chakra is in balance, you are creative, independent have balanced sexual energy and feel calm. On the negative side, you are likely to withdraw into your own space away from others. The root chakra is red. It has a lot to do with are connections to the earth, survival, sercurities/insercurities,fears, money, how you feel about yourself/ where your from. In balance, you feel: courage, strong ready to take on any challenge, out of balance you feel: Fearful, unable to move forward, stuck and insecure.